What is a New York Sublease Agreement? New York Sublease Agreement: What Is It? A New York sublease agreement is a legal document that establishes a peer-to-peer tenancy agreement between two tenants. 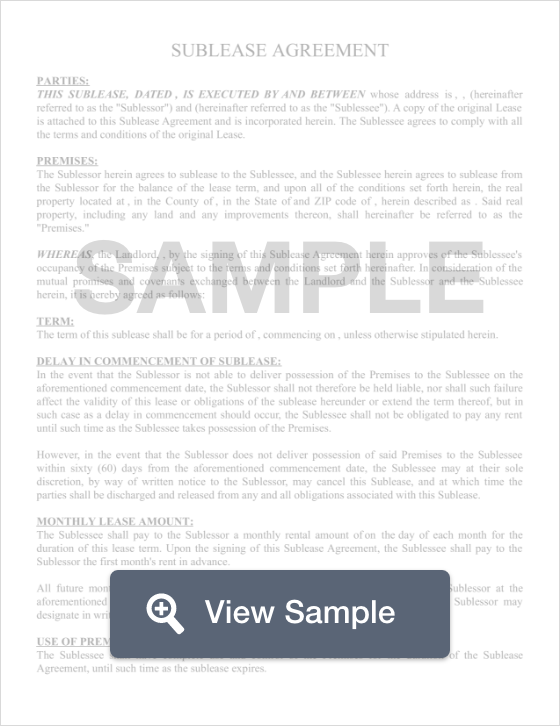 In this type of agreement, the original signer (a sublessor) of an apartment or rental property will find another tenant (a sublessee) to move in. This means that the sublessee will move into the rental, paying rent and abiding by the rules of tenancy while the original tenant is gone. These types of agreements are usually for short periods of time and work well for both the sublessor and sublessee because of the extreme flexibility. One important fact to know about sublease agreements is that the sublessor’s name remains on the lease throughout the agreement. This means that if the sublessee pays rent late, abandons the apartment or damages the rental, the original tenant will be held responsible. New York Tenant/Landlord Laws grant tenants the right to sublet their apartments, and the landlord cannot unreasonably refuse the offer. In addition, sublease agreements must be at least 30 days and the tenant must receive landlord approval.